Germany Berlin wall was amanifestation in concrete of the iron curtain a symbol of the cold war that split the continent into east and west. The communist Soviet Union influenced the East and the countries of the West were under democratic government. In turn the fall of the Berlin Wall represented a sign of unity. After World War II the victorious powers of GreatBritain, France, America, and the Soviet Union divided Germany in administrative sections. As a result the iron curtain ran through Germany, separating Eastern Europe from the Baltic Sea to the Black Sea. Berlin the capital, though in the centre of the Soviet Union section was considered strategically so important that each of the Allied forces required presence and Berlin was split into four divisions. In response to a newly introduced unified currency in West Germany the Soviets set up the Berlin Blockade, between 1948 and 1949, in order to starve West Berlin and regain more influence. As a western counter measure the Berlin air lift was born. This ambitious plan meant to fly in all provisions needed by West Berliner citizens by plane. When the Soviets realized their failure to starve the western exclave restrictions were lifted. Despite that the established air routes remained main transport for all supplies to prevent dependency on Soviet managed roads and rails. In the following years dissatisfaction with economic and political situation in East Germany grew. West Berlin, a gap in the iron curtain, became the destination for Eastern refugees. The Berlin wall was build to replace the barbed wire that sealed East Germany and the trend to flee to West Germany since the 13th August in 1961. The Germany Berlin wall was supported on the east side by a parallel running barrier. A highly guarded area between the two barriers was created as no-man’s land. It soon was named death strip. People trying to escape died there. Change came, after several weeks of civil unrest,when Berlin borders opened up to allow visits between east and west onNovember the 9th in 1989. Formal conclusion of German’s reunification took place on 3rd October 1990. After 28 years the fall of the Berlin wall reunites East Berlin with West Berlin as well as East Germany with West Germany and symbolizes the end of the cold war with its iron curtain. In memory to this event the public holiday "Day of German Unity" was established. 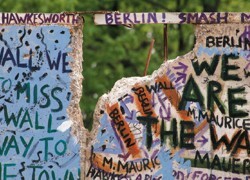 The Wall trail gives opportunity to trace the history of the Berlin wall with memorials and information boards. Go back from Germany Berlin wall to Berlin Germany.